I am not going to do a Book of the Month post. I could, but that seems like pressure. Normally I stick to non-fiction, bet it history or (auto)biographies or memoirs. For our extremely sporadic book club (i.e. two books in a decade), we get into fiction - and I'm good with that. So, I got a galley copy of The Mockingbird Next Door: Life with Harper Lee. Had I been required to pay for it, I might not have bothered to pick it up, let alone purchase it. But it was free, and truth be told, I was curious. Oddly, for me, it was not required reading in high school. Apparently it is for 70% of the schools in the United States. But I still read it as a teen. Even more odd, I've seen the movie, but in chunks and out of order. Still, it's a great piece - on paper or on film. Harper hasn't truly given an interview since 1964, so I was intrigued when she allowed a Chicago reporter to talk with her and her sister, Alice for a newspaper article. I was even more intrigued at the friendship that allegedly bonded between the three, enough so that Marja Mills (the author) moved next door to the Lee sisters. It seems like they talked and had coffee daily - or a meal or a day trip. What a frickin' treat. The Lee sisters sound like a hoot and a half to be around. The story is fairly well told (since it is a galley copy, there are corrections that need to be made. I found some spacing, spelling and date errors), and it is a very light-hearted and easy read (two medium plane trips and an additional 30 minutes at home). ....though it is getting weirder to be one of the few (if not only) person on a plane reading a physical book. Nelle was very specific about what her neighbors and friends could talk to Mills about. She was also clear about their private conversations on what was on and off the record. It seems like Mills abides by all of that. So, I'm not sure if the question was ever asked or just unreportable, on if Lee ever wrote anything else. We know nothing else was published, but are there written manuscripts somewhere? Even if there are, it is questionable if they'd ever see the light of day after her death. Lee has kept a fairly tight reign on her brand and even stopped signing copies of her books as people would put them on e-Bay for profit. Still it is a quick read and hopefully legit. Nelle (or her lawyers) tried to stop the publication of the book saying she gave no authorization to Mills to use their conversations, nor did she ever participate in this book. Alice, a lawyer, says otherwise. But Nelle is also suing the town of Monroeville, AL, where she lived all these years, for trying to profit on her image, though she supported the museum and annual play of Mockingbird for the last 21 years. I'm not sure how much of this push back is just lawyers or how much is repercussions of a stroke she had a few years back. But the story is interesting - and in part due to her reclusiveness and her only attempt at literary success. Had she been accessible all these years or turned out book after book, I'm not sure the mystique would be there. ...and it's also a little fun to see her semi-trash her one-time neighbor and friend, Truman Capote. But they are tales of the Lee family and the South in general. It is very much a book about local colour as it is about Lee, the women, as opposed to the author and lawyer. After 18 months of living next door to, plus the two years of travel beforehand, I'm not sure I could have moved away from the Lee sisters. Why would you want to? 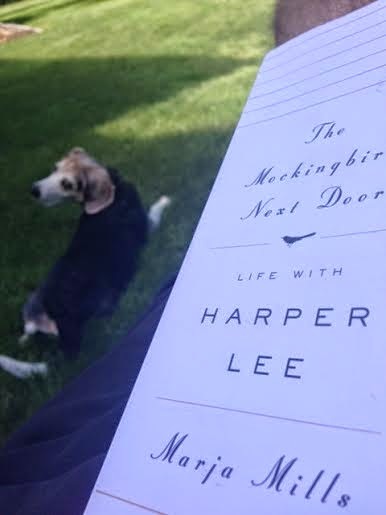 The Mockingbird Next Door is nothing to run out and purchase (or hit 'download'), but it's an easy, fun read. I am not a fan of biographies, but I may make an exception for this one. I generally like biographies and To Kill A Mockingbird was one those rare 'twofers' from childhood; a book I loved made into a movie I loved. I am a fan of the book and movie, and have read other biographies of Lee. I'd love to read this one. As for whether or not she wrote any other books, my college English teacher who grew up in Monroeville and knew Lee, told us that she had in fact written at least one other book, but decided to not have it published. I always felt that she was afraid it would not be the success that To Kill a Mockingbird was. Also, there have long been rumors that she actually wrote Truman Capote's book,In Cold Blood, but in turn! some have claimed that Capote actually wrote To Kill a Mockingbird. By the way, I just found your blog and have instantly become a fan.